This savory meal is based on a beautiful recipe is from Bon Appetit. And yes, everything’s better with coconut milk! 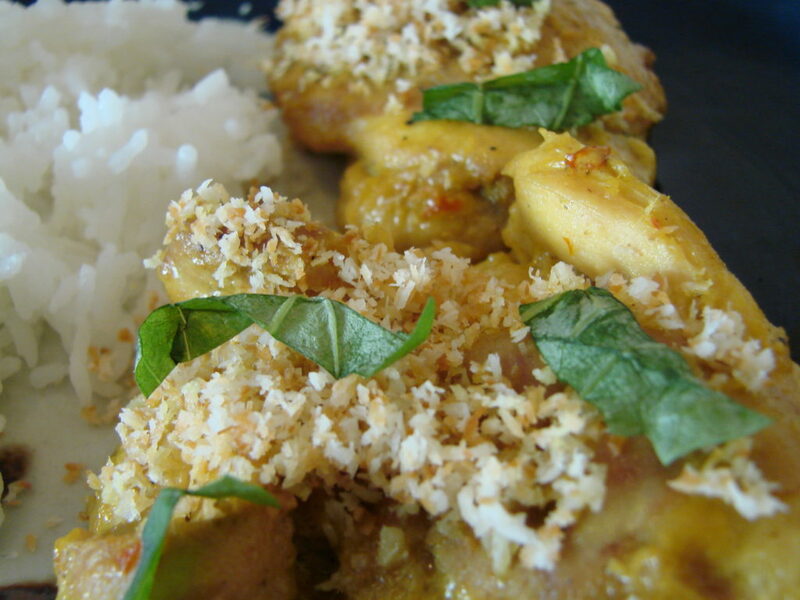 Coconut chicken with lemongrass and coconut goes well with jasmine rice. 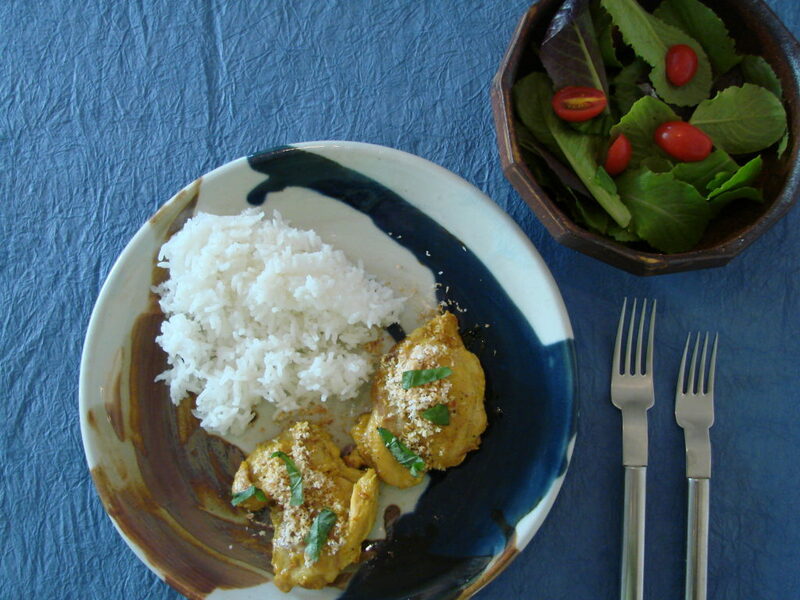 Similar to a rendang, the aromatics in this dish gradually brown in the pan, giving it a distinctive flavor and texture. 1 15-oz unsweetened coconut milk—everything’s better with coconut milk! remove outer layers from lemongrass, remove and reserve a couple of inches of trimmed lemongrass bruise (with a knife handle), tie each into a knot. 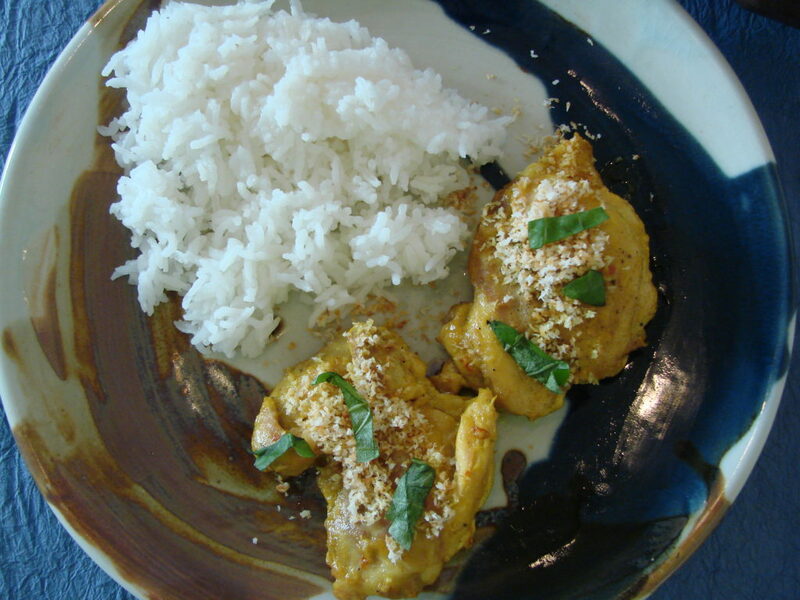 put reserved lemongrass, shallot, garlic, ginger, pepper flakes, turmeric and 2T of water in small food processor and make a paste out of the added ingredients. Season chicken with salt and pepper and heat oil in a large skillet (I use cast iron) and cook skin side down (if it has skin) for about 10 minutes, until skin is crispy. Set aside in a plate. cook the spice paste in the same skillet until it begins releasing its aroma—about 5 minutes. add the lime leaves (if using), cinnamon, cardamom, star anise, coconut milk, sugar and knotted lemongrass. Bring to a simmer, add chicken and cook, turning the chicken once every so often until it is falling-apart tender. This will take between an hour and 1.5 hours. Carefully toast the shredded coconut in a dry skillet (I use nonstick for this) until it begins turning golden, then cool. At this time you’re ready to serve: arrange chicken on a plate or platter and spoon any remaining coconut milk/spice liquid over the top. Add the cilantro and toasted coconut and serve. 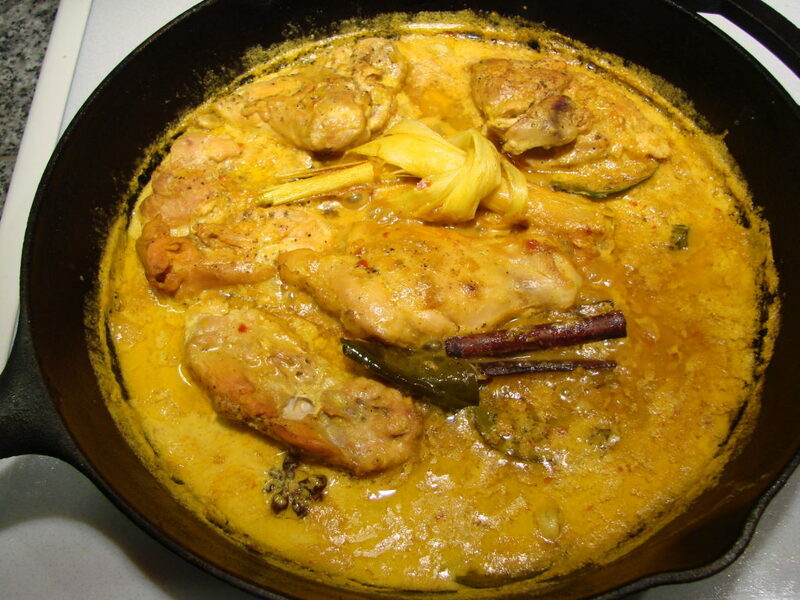 Here’s the step where the chicken and all the spices are slowly cooking in the coconut milk. Here’s another shot of the dish without that pesky salad. You can spoon any extra sauce over the rice. I made this tonight, and it was great. Just wish I had doubled it…we love leftovers. Glad to hear it! Good reminder for me. I haven’t made this in a long time.